The Little Red Feather partnership has been at the forefront of innovation for Thoroughbred ownership groups. 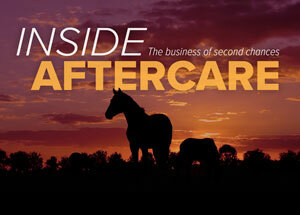 From launching in 2002, the group now has more than 300 active partners, has successfully crowdsourced a winner through their LRF Thoroughbred Fund, and now is stepping into aftercare. Through a new 501(c)(3) organization called Little Red Feather Cares launched in 2016, the group aims to help every former Little Red Feather runner have a chance to successfully find a second career. "LRF Cares provides aftercare for all LRF horses, whether they finish their careers with LRF or not," said LRF managing partner Gary Fenton, adding that LRF partner Renee Parcell is spearheading the effort. "It started because we have so many great partners who wanted to see better aftercare for their horses." While the group is still fairly new, the LRF Cares team sees it as their responsibility to care for their runners after their racing careers are finished, and is designing new ways to keep track of all of their former charges. "We are working on a central database to track all LRF horses," Fenton said. "In the interim, when our organization finds one of our current or former horses who needs attention, we step in immediately and help. To date that help has been using our financial and networking resources to find proper homes for our retired athletes." One thing LRF Cares is careful not to do is push their racing partners into donating to their charity, which can be a tricky road for ownership syndicates to navigate. "The great thing about LRF and LRF Cares is we respect each of our partners' charitable desires," Fenton said. "Other syndicates make each partnership donate to aftercare. We set up this charity to allow the partners that want to participate to do so while not putting any pressure on those who give elsewhere." One former LRF runner has successfully transitioned from their racing syndicate into a new career as a sport horse, where he is being syndicated yet again. McLovin had moderate success in his 19 career starts mostly in claiming races, carrying the LRF colors to the winner's circle five times. But now, the 12-year-old gelded son of Hussonet is going full speed ahead into a second career as a four-star eventer. The former runner is paired with Anita Nemtin-Gilmour, a top-level rider who competed in the 1996 Olympic Games representing Hungary. McLovin was sold to Nemtin-Gilmour in the fall of 2016 by his former rider Ryan Wood, with whom he competed with in a number of 3-star and 4-star events including a 32nd-place finish in the 2016 Rolex Kentucky Three-Day Event. "He's actually competing at the top level of three-day eventing," Nemtin-Gilmour said. "I'm hoping to qualify him for the World Equestrian Games next year in Tryon (N.C.). He's very good to work with, he's very much a Thoroughbred." Anita Nemtin-Gilmour and former LRF runner McLovin. Photo courtesy of Anita Nemtin-Gilmour. 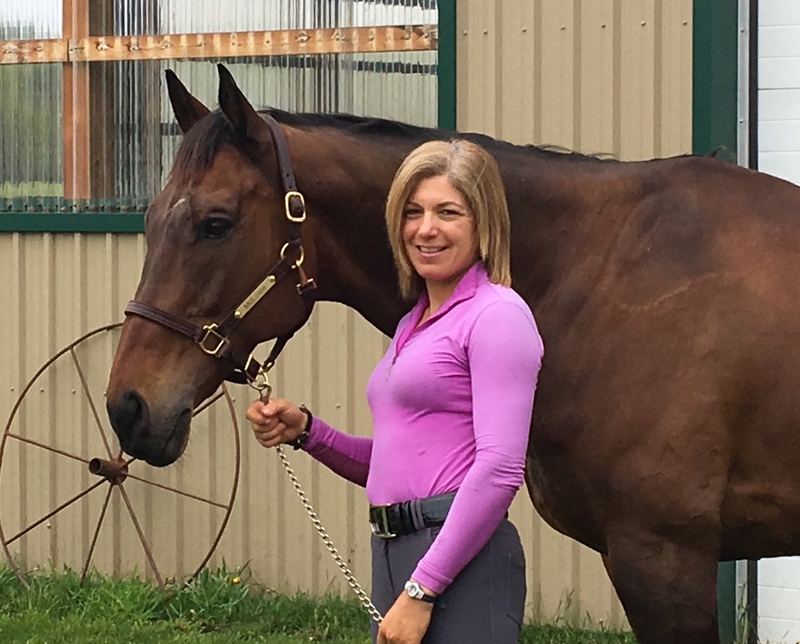 Based in Ontario at her Top Notch Farms, Nemtin-Gilmour has been competing at the top-level since the '90s and enjoys being paired up with a competitive Thoroughbred. "They're smart. People think (Thoroughbreds are) hot, but I don't find them necessarily hotter (than other breeds). I find them smarter, more sensitive, and they have a lot of heart and usually a lot of athletic ability," she said. Although Nemtin-Gilmour knew McLovin was an off-track Thoroughbred, she didn't know too much about the horse's past until she got a message on Facebook one day. "I didn't know Little Red Feather at all. I bought him from his former rider Ryan Wood," she said. "I actually posted a picture of myself riding him on Facebook. And (the photo) just happened to show up on (Little Red Feather partner) Josie Gump's Facebook feed, so she contacted me and said, 'I think we used to race this horse.'" The two began talking and ended up meeting in person at a horse show in Florida. Nemtin-Gilmour mentioned that she is syndicating McLovin, just like he was during his racing career, and Gump ended up buying into McLovin once again. "The buy-in is pretty low and the maintenance is pretty low, but it's a great way to get a group of people together to share in the experience," Nemtin-Gilmour said of the sport-horse ownership syndicates she has put together. With qualifying competitions in the near future for McLovin on his way to a possible bid at the World Games, the former runner may find himself with a large cheering squad of co-owners once more.